Excerpts from the teachings on the first day of the Oral Transmission of The Rinchen Terdzö - ‘The Precious Treasure Teachings’ of Jamgon Kongtrul Lodrö Thaye the Great , held at Palpung Sherab Ling Monastic Seat, India, in 2006. Today I want to introduce you to The GreatRinchen Terdzö, ‘The Hidden Treasure Teachings’ that were revealed, composed, and passed on to us by Jamgon Kongtrul Lodrö Thaye the Great. The transmission of his collection of texts and empowerments have been requested by many Lamas, Tulkus, members of the ordained Sangha, and other students for some time, but it wasn’t possible to begin until now due to outer circumstances. While embarking on this journey today, not everyone who made the request is able to attend and others can only be here for a short while. The benefit of receiving The Rinchen Terdzö transmission lies in your practice, and its benefit for the world lies in the preservation and propagation of the pure Lineage of Jamgon Kongtrul Rinpoche. I pray that some noble tendency towards the Dharma, even if it is only small, is planted in your mind-stream through this transmission. The main recipient with us here is the Fourth Jamgon Kongtrul Rinpoche. He is the actual custodian of this precious treasure. Giving the transmissions of The Rinchen Terdzö to him means returning them to their source. I offer my prayers that in the future Jamgon Kongtrul Rinpoche will ensure the benefit of The Five Great Treasures for the welfare of all living beings and for the sake of the world. Today I will give a brief overview of The Rinchen Terdzö. Many of you may already know about it, but many of you may not. Having an overview is useful because then you better appreciate what you are receiving. Seeing that August is the hottest, most rainy, most humid, and most muddy month of the year in this part of the world, you might be wondering why I am beginning this event at this time. You might think that beginning in October would be more pleasant, but finishing them by the end of October makes it possible for those persons who want to attend the Great Karma Guncho debates and the Great Kagyü Mönlam Chenmo to be there. Venerable Chöje Lama Phuntsok initiated the Karma Guncho debates in Nepal many years ago. Venerable Kyabje Kalu Rinpoche initiated the Kagyü Mönlam, and the Third Jamgon Kongtrul Rinpoche gave him much support. Venerable Bokar Rinpoche directed the Kagyü Mönlam; after he passed away, Lama Karma Chödrak organized and continues rendering this service. Ever since His Holiness the XVIIth Gyalwa Karmapa arrived in India, some six years ago, a part of his activities has been to lead the Kagyü Mönlam, which is a real stroke of good fortune. Many people thus have had and continue having the wonderful opportunity to meet and serve His Holiness then. So that disciples experience no conflict and can attend these events, I decided to begin offering the transmission of The Rinchen Terdzö at this time. Of course, it is inconvenient being here at this time of the year. People might ask and think, “Why on earth is Situ Rinpoche doing this now? What an odd Lama! He goes to Tibet in the dead of the winter and gives these empowerments in the heat of the summer in India!” Even though you are uncomfortable, there is a purpose. Think that any discomfort you might feel is a means to purify your obscurations. Don’t think that it’s a hardship, all right? It’s not all that hot. There’s a saying: “Once you have seen a snake, a frog doesn’t look that bad.” Before you have seen a snake, you might think that a frog that you see is bad, but after you’ve seen a snake, a frog doesn’t look that terrifying. In the same way, compared to places that are really hot, I don’t think it’s that bad here. Sure, the weather makes it a bit more difficult for the organizers, for you, and for me, too. I don’t like hot weather either, but what can we do? For now, think that this is a way to mature spiritually by purifying yourself of obscurations. I thought it would be good to discuss The Rinchen Terdzö in several steps. In general, this great collection is said to consist of terma teachings. Terma (spelled gter-ma in Tibetan) means ‘treasure.’ Termas are concealed treasures hidden mainly by Guru Padmasambhava and Yeshe Tsogyal, to be discovered at the proper time for the benefit of future disciples by a tertön (gter-stön), a ‘treasure revealer.’ The Rinchen Terdzö is not entirely terma, though. It also contains teachings from the Bon Tradition and from the Kama Tradition. Bon is the religion of Tibet before the Dharma was introduced there. Kama (bka'-ma) is the long oral transmission that has come down unbroken since the time of Guru Rinpoche, Padmasambhava; it consists of the main practices, initiations, instructions and commentaries of the Nyingma Tradition. Jamgon Kongtrul Lodrö Thaye definitely had a reason to include the teachings of the Bon and Kama in The Rinchen Terdzö as well as teachings of many incomparable Lamas. If I were to name them all, there would be too many, but let me at least tell you the names of a few of the more renowned masters. If you know that this collection contains their termas and their works, that knowledge is almost sufficient in itself. From among The Five Great Treasures, the one entitled Gyachen Kadzö - ‘The Treasury of Vast Teachings’ contains the collected writings of Jamgon Kongtrul Lodrö Thaye, works he himself composed. The Shecha Dzö - ‘The Treasury of All Knowledge ’ is a collection of his writings on all fields of knowledge, also including all secular fields of study. The Rinchen Terdzö - ‘The Precious Treasure Teachings’ contains the terma teachings. The Kagyü Ngagdzö - ‘The Treasury of Mantra of the Kagyü School’ contains the Kagyü Mantra teachings. And the Dam Ngagdzö - ‘The Treasury of Precious Key Instructions’ is a collection of teachings that Jamgon Kongtrul Lodrö Thaye wrote and compiled. So, the last three are not exclusively the works of others that he simply collected and arranged. For example, TheRinchen Terdzö contains more than 800 distinct empowerments and their respective Sadhanas (‘liturgies’). Jamgon Kongtrul Lodrö Thaye wrote a commentary on each Sadhana and its specific ritual practice and placed them in this sacred text. So he didn’t simply take texts that already existed and arrange them in a collection. There are a great many of his writings in The Five Great Treasures, each providing missing elements and supplementary material. When Jamgon Kongtrul Lodrö Thaye composed and arranged a ritual text, it was, in fact, largely the case that he did this together with two other renowned masters, Jamyang Khyentse Wangpo and Chogyur Dechen Lingpa - their minds came together as one. Strictly speaking, Jamyang Khyentse Wangpo was a Sakyapa, Chogyur Dechen Lingpa was a Nyingmapa, and Jamgon Kongtrul Lodrö Thaye was a Kagyüpa. But these masters were not concerned with issues of being a Kagyü, or a Nyingma, or a Sakya, rather, due to having deep respect for one another and due to having the same intention, their minds were in perfect accord. This can happen - minds can be in complete accord, just as bad things can happen when people are disrespectful of each other and are in discord. In fact, such complete accord and mutual respect for one another are signs of truly authentic Gurus and great spiritual beings. Khyentse Wangpo, Chogyur Dechen Lingpa, and Jamgon Kongtrul Rinpoche demonstrated that this is the case in this collection of sacred teachings. And so, TheRinchen Terdzö also contains many writings of Jamyang Khyentse Wangpo and Chogyur Dechen Lingpa. “O Vairocana, you are the universal monarch of the Dharma. This prayer tells us that Jamgon Kongtrul Lodrö Thaye was an emanation of Buddha Vairocana, rNam-par-snang-mdzäd, ‘The Sun-like Buddha,’ Lord of the Tathagata Family. Of the eight great Bodhisattvas, he was an emanation of exalted Manjushri. Of the Shravakas, he was Ananda, one of the ten close disciples of Lord Buddha and his personal attendant. Of the great Tibetan translators, he was Bairotsana, who was one of the first seven monks to be ordained in Tibet and who became the great and unequalled translator during the reign of King Trisong Detsen. On December 14 th in the year of the water-horse (1813 C.E. ), he took birth into a Bonpo family as Kongpo Bamteng Tulku, in the little village of Rong-gyap, which is situated in the district of Derge and was ruled by the King of Derge. A series of events occurred while Jamgon Kongtrul Rinpoche was still quite young. 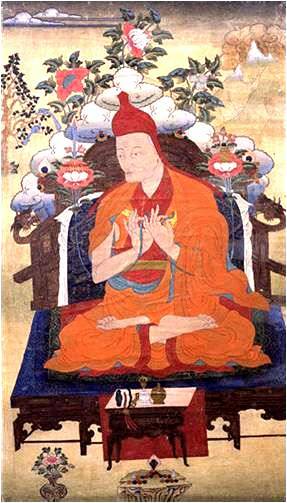 His father, Yungdrung Tenzin, was an illustrious Lama of the Kyunpo clan and had quite a strong character. In Tibet, government officials, who were a kind of second-level minister, were called bdun-‘khor (‘retinue in the presence’); a hor-‘dra (‘a government messenger’) was a kind of third-level official. When the hor-‘dra for Rong-gyab, whose name was Tralgyap, came to the area, something happened to upset Jamgon Kongtrul Rinpoche's father. He beat the messenger up and was thrown into the prison of Rong-gyap Fortress as a result. Even though Jamgon Kongtrul Rinpoche was still just a young boy, he journeyed to the fortress to visit his father in jail. Due to his former karma and aspirations, the chieftain of Rong-gyap, who resided in the fortress. recognized that Jamgon Kongtrul Rinpoche was quite extraordinary and took him under his care. Having studied secular subjects to some degree under his tutelage, Jamgon Kongtrul Rinpoche then went to Shechen Monastery, one of the six principal monasteries of the Nyingma Tradition. He received teachings on Buddhist Sutras and Tantras as well as pith tantric instructions, and because of the special propensities he had developed in his former lives, he could easily understand everything he heard and contemplated. One day the Rong-gyap chieftain, a Nyingmapa, set off on a pilgrimage to visit Kathok, Pelyül, and other main Nyingma monasteries. At this time, Jamgon Kongtrul was an adolescent. In any case, he accompanied the chieftain on this pilgrimage. When they reached the great monastery of Derge Gonchen, Jamgon Kongtrul Rinpoche heard about Palpung the first time and was told about the Ninth Situ, Pema Nyingche Wangpo. It seems that a latent tendency awakened in him, so he felt an irresistible urge to go to Palpung. He took leave of the chieftain and went. When he arrived at Palpung Monastery, Jamgon Kongtrul Rinpoche met Palpung Ongen. He introduced him to Situ Pema Nyingche Wangpo, who gave him a new name. It was actually at this point in his life that he was given the title "Jamgon Kongtrul." When he received the monastic ordination from Situ Pema Nyingche Wangpo, Jamgon Kongtrul Rinpoche was given the name Yönten Gyatso; when he received the Bodhisattva vows, he was given the name Lodrö Thaye. When he later received tantric empowerments, he was given the secret name Pema Garwang. In connection with termas that he revealed, he bore the title “ Chime Tennyi Yungdrung Lingpa .” So Jamgon Kongtrul Rinpoche had several titles and names. Let me speak about Jamgon Kongtrul Lodrö Thaye’s work on compiling and writing The Five Great Treasures. In talking about his life and work, I’m saying what is actually the case. I’m not praising him because he was a Lama of my monastery. At a time when the Buddhist teachings in Tibet, the Land of Snows, were like a lamp running out of oil, he rekindled the lamp of the Dharma. There was no one like him in revivifying the teachings; that is something I can state categorically. I’m not being sectarian when I say this, but I’m just telling the truth. You may wonder why Jamgon Kongtrul Rinpoche compiled and wrote The Five Great Treasures. The Buddha's teachings constitute a lineage. It isn’t enough for there to be many people wearing maroon robes and shaving their heads; that doesn’t make the teachings flourish and spread. There are a great number of maroon garments for sale in shops, and people might have their hair shaved because they don’t want to sweat so much in the heat. If you think that the Buddha’s teachings flourish and spread because of the many monks or nuns, or because of the huge monasteries, or because of the many texts and books that are being written, you are mistaken. The Buddha's teachings flourish and spread when disciples keep the Pratimoksha vows on the outer, worldly level, when a Bodhisattva’s training is practiced on the inner level, and when the tantric commitment of the Masters of Awareness is retained on the secret level. Do you understand my point? What did Jamgon Kongtrul Lodro Thaye foresee? He could see that the Eight Great Lineages of Accomplishment as well as the indigenous Bon Tradition were facing a great catastrophe in Tibet. In order to avert the catastrophe, he saw that it was necessary to receive the empowerments, the oral transmissions, and the instructions. He knew that it would be tragic if no lineage of teachings and no pith instructions could be imparted in the future. In which way would that be tragic? Forget about the training of tantric practitioners and Bodhisattvas; even the Pratimoksha precepts for individual liberation would be lost. When the Pratimoksha precepts are lost, nobody can be ordained. Realizing that the ongoing lineages of empowerments, oral transmissions, and instructions would become impaired or lost, Jamgon Kongtrul Rinpoche undertook the incredible challenge of the times. For example, if someone like me, with a sound body and mind, were to undertake a similar challenge, I wouldn’t be able to produce such remarkable results in thousands of years. Yet, due to his karma and aspirations, Jamgon Kongtrul Rinpoche did produce such results during his life. If we look at his life, it seems as if he spent his entire life conferring empowerments. From another point of view, it seems as if he spent his entire life giving Dharma teachings. From another point of view, it seems as if he spent his entire life receiving empowerments and oral transmissions. And from another point of view, it seems as if he spent his entire life compiling the empowerments and teachings into The Five Great Treasures. In fact, it seems that he accomplished the work of many people, not just the work of a single Lama - and that was his unique quality. Among The Five Great Treasures, The Kagyü Ngagdzö – ‘The Treasury of Mantra of the Kagyü School’ contains all tantric transmissions of the Kagyü Lineage, with emphasis on those of the Sarma (the ‘New’) School. The Dam Ngagdzö – ‘The Treasury of Precious Key Instructions’ contains the teachings and empowerments of the Eight Great Lineages of Accomplishment. These eight are the Nyingma, Kadampa, Lamdre, Marpa Kagyü, Shangpa Kagyü, Shije, Jordruk, and Dorje Nyendrup. Of these, Kadampa refers to the tradition up to the time of Lord Tsongkhapa. After his great seat of Ganden was established, this tradition was called ”Gelugpa,” so Gelugpa and Kadampa are identical. Lamdre is the name of a cycle of spiritual teachings, so Sakya is the name of the main seat of these spiritual teachings, which is located in Tsang, Central Tibet. Marpa Kagyü is the lineage of profound teachings that Master Marpa the Translator brought to Tibet from India; it is the lineage that derives from the students of the incomparable Dakpo Rinpoche, Lhaje Gampopa. There were four major schools that principally came from the First Karmapa, Düsum Khyenpa, and eight minor schools that were founded by students of Phagmo Drupa. Among the four main schools of the Kagyü Tradition, there is the Kamtsang Kagyü and its sub-schools, such as the Nedo, Zurmang, and Gyaltong. Distinguishing them, four major and eight minor schools of the Kagyü Tradition evolved, which all descended from students of the incomparable Dakpo Rinpoche. They are collectively referred to as “Marpa Kagyü.” As for the Shangpa Kagyu Tradition, there was a contemporary of Marpa Lotsawa, whose name was Khyungpo Näljor. He journeyed to India and received teachings from Niguma, Sukhasiddhi, and other great masters. The lineage he founded is called “Shangpa Kagyü.” Some people think that the Shangpa Kagyü is one of the four major or eight minor schools just mentioned. These people may be learned in the scriptures, secular fields of knowledge, pith instructions, practical methods, and so forth, but they are a bit lacking in their knowledge of history! The Shije (‘Pacification’) Tradition is the lineage of the Chöyül teachings that were passed down from such Gurus as Padampa Sangye and Machik Lapchi Drönma. The Jordruk (‘Six Techniques of Union’) Tradition is also called “Jonangpa.” Because it was passed down by Siddha Orgyenpa, the Dorje Nyendrup (‘Vajra Approach and Accomplishment’) Tradition is also called the “Orgyen Nyendrup.” So, The Dam Ngagdzö is a collection of all instructions of the Eight Great Lineages of Accomplishment; in addition, Jamgon Kongtrul Rinpoche included a few cycles of teachings from the indigenous Tibetan Bon Tradition. Jamgon Kongtrul Lodrö Thaye travelled wherever it was necessary to receive rare and precious empowerments, rare and precious oral transmissions, and invaluable instructions. He then produced The Dam Ngagdzö collection, just as he gathered all cycles of the Kagyü teachings to produce The Kagyü Ngagdzö. He gathered all the cycles of terma teachings to produce The Rinchen Terdzö. The Gyachen Kadzö contains works that Jamgon Kongtrul Rinpoche authored. And he collected his writings that covered the entire range of fields of knowledge into The Shecha Dzö – ‘The Encompassment of All Knowledge. ’ F ields of knowledge doesn’t only refer to spelling and grammar; but covers the ten traditional sciences. They are: rhetorics, astronomy and astrology, grammar, performing arts, lexicology, handicrafts, medicine, semantics, dialectics or logic, and Buddhist philosophy. From time to time, Jamgon Kongtrul Rinpoche learned about a lineage of teachings that was becoming exceedingly rare. He would travel to some isolated place, where the lineage-holder who might be an old individual who couldn't even read very well was staying, and he would receive the lineage from him. He would look to where the lineages were; he was not interested in receiving teachings from great Lamas or famous people and didn’t disregard humble and less popular lineage-holders. Jamgon Kongtrul Rinpoche did all of this for the benefit of the teachings in general, and so the term “ Rime” (ris-med, ‘non-sectarian’) is a very appropriate description of him. In fact, all three masters, Jamgon Kongtrul Lodrö Thaye, Jamyang Khyentse Wangpo, and Chogyur Dechen Lingpa were great non-sectarian masters, which the historical accounts attest. To give you an analogy: Suppose there is a lake of fine water that has eight qualities. No matter from whichever side of the lake you drink, east or west, north or south, the water has those eight qualities. In the same way, if you have faith, samaya (‘commitment’), diligence, and devotion for the Eight Great Lineages of Accomplishment, then you can attain Buddhahood by engaging in any practice they teach. It’s not the case that one is better or worse than another. On the basis of that understanding, you have respect and you honor all of them. There is a saying, which is: "Killing one to save another." You shouldn't act in such a way. Whichever school of Dharma you follow and practice, whichever historical lineage you belong to, you practice in that specific way. We do not have the exceptional karma and noble aspirations that Jamgon Kongtrul Lodrö Thaye, Jamyang Khyentse Wangpo, and Chogyur Lingpa had. If we tried to practice according to all Eight Lineages of Accomplishment, we would only become confused and end up accomplishing nothing. Rather, each of us practices the teachings of our own lineage, serves the teachings, and works for the welfare of beings on that basis. Although we can’t practice the instructions of all lineages, having faith and devotion and acknowledging that all teachings are equally invaluable is what Rime means. Furthermore, serving and honoring our own lineage while disparaging the teachings of others is a very bad thing to do. In that case, we are actually betraying our own lineage and not serving it! Whatever our own lineage is, we uphold the teachings, and if we can serve other schools of teachings, we do so. If we can’t, at least we respect them and understand that they are pure. It’s very important to be careful and to ensure that we regard all lineages well so that they aren’t threatened of becoming impaired or corrupted. It’s important to be careful that no discord arises among the lineages. We need to act as though we had to enter a thicket of thorn bushes; we would put on appropriate clothing and protect ourselves from being injured if we knew we had to. Do you understand my point? We must be in harmony with all schools of teachings. We must honor and respect all of them. Also, if you don't look after your own teachings, no one else will look after them for you. And so the term “Rime” doesn’t mean mixing everything together. In the case of someone like Jamgon Kongtrul Lodro Thaye, for example, while he was Rime, ‘non-sectarian,’ his seat was at Palpung, so he was Jamgon Kongtrul of Palpung. From among the Eight Great Lineages of Accomplishment, he considered the Kagyü the most important for himself. When he founded his retreat center, he instituted a program of practice that consisted of the complete cycle of the incomparable Shangpa Kagyü teachings. He always made sure that everything was authentic. If we examine what has happened in the last 200 or 300 years, we see that if there had been no Khyentse, Kongtrul, and Chogyur Lingpa - and especially if Jamgon Kongtrul Rinpoche had not produced The Five Great Treasures - , it would be impossible to receive certain teachings and nobody would know how to find an authentic lineage-holder. To put it in a nutshell, we wouldn't be able to find them. Nowadays and in recent times, people have no time, so lineages can become dissevered. If they are dissevered, the tradition of teachings will degenerate. When we say that the Buddhist tradition can degenerate, people think this just means there will be no more monasteries, no more texts, no more monks. But to say that a tradition has degenerated really means that a lineage has become disrupted. There may still be monasteries, monks, texts, and so forth, there may even be more of these than ever before, but if a lineage is interrupted, then the tradition of teachings degenerates. If a tradition has degenerated due to there being no lineage-holders, rather than trying to survive by using the teachings that are written on paper, it would be better for a servant to run to where his basic needs are met, as the saying goes. If a servant runs to where his basic needs are met and makes enough effort to at least get enough to eat and to keep his body and soul together, he should do that. But for anyone to sell the Dharma in the absence of an authentic lineage is deplorable. The only destination for anyone who lives off such misappropriated gains is the vajra hell - nowhere else. If there should be a place worse than the vajra hell to go to, he would go there! Of the eighteen hells described by Lord Buddha, the vajra hell is the worst. And that is where somebody would go if they make money on the Dharma - nowhere else. Jetsün Milarepa stated that he wasn’t afraid of anything except misappropriated gain from spirituality. It is like lumps of red-hot iron or boiling molten metal. If you think you can consume lumps of red-hot iron, you need a stomach that is made of diamonds! If you had a diamond stomach, then you could drink boiling molten metal; otherwise, for people like us who have flesh-and-blood stomachs, if we drink molten metal, it slides right through us! That's one way of describing the vajra hell. So, lineage is very important. Let me now speak of those masters who were the authentic sources of the teachings that are to be found in The Rinchen Terdzö. They include: Guru Padmakara, the Great Master Vimalamitra, exalted and sublime Acharya Nagarjuna, Bodhisattva Sadaprarudita, Dampa Gyagar, Dombi Heruka, Mahasiddha Jetari, Ahum of Nepal, and many learned and accomplished masters of the holy land of India. The Tibetan masters include the Great Translator Bairotsana, Bari Lotsawa, Nyangräl Nyima Özer, Orgyen Terdak Lingpa, Karma Lingpa, Shikpo Lingpa, Sangye Lingpa, Dudül Lingpa, Tsasum Lingpa, Jangchub Lingpa, Kunchong Lingpa, Ratna Lingpa, Rigdzin Jigme Lingpa, Yarje Orgyen Lingpa, Zurkar Drime Lingpa, Tau Rokje Lingpa, and other great tertöns. As well, there are teachings that derive from Jetsün Taranatha, Minling Terchen, Minling Lochen, Karma Chakme Raga Ase, and several of the successive Chakme incarnations. Furthermore, Ju Mipam, Ngari Panchen, Namcho Mingyur Dorje, Yonge Mingyur Dorje, Kathok Dampa Deshek, Kathok Rigdzin Tsewang Norbu, Rigdzin Jatson Nyingpo, Ontön Kyergangpa, Rigdzin Longsäl Nyingpo, Rigdzin Gokyi Demtruchen, Rigdzin Takgi Shamtapchen, Lhatsün Namkha Jigme, Guru Chowang, Yuthok Yönten Gonpo, Zurkar Dawai Özer, Gyalwa Longchen Rabjam, Latri Gyalwa Yungdrung, and other authentic masters. There are also teachings from Tsele Natsok Rangdröl, Jongling Pälden Gyaltsen, Siddha Tamdrin Gonpo, Nupchen Sangye Yeshe, Mila Shepa Dorje, Namkhai Nyingpo, Düdjom Rolpatsäl, and a number of the Karmapa incarnations, such as Karma Pakshi and Rangjung Dorje. Similarly, there are teachings passed down from the great Fifth Dalai Lama. Also Khonlui Wangpo, Siddha Tangtong Gyalpo, Drigung Rinchen Phuntsok, Drigung Chökyi Drakpa, Shamar Konchok Bong, and several other Shamar incarnations. Furthermore, Situ Pema Nyingche Wangpo, and several other Situ incarnations. Also, Karme Khenpo Rinchen Dargye, Belo Tsewang Kunkhyap, Minyak Tashi Tobgyäl, Mingyur Päldrön, Gya Lotsawa, Chögyal Dorje, Padrowa Tsering Dorje, and many other peerless spiritual masters. This list is just a summary of some of their names. If we consider the historical succession of these masters, some of the names I mentioned are from the distant past, others are more recent. So, strictly speaking, the succession is a bit mixed up, but if we consider the titles of the works, the foregoing list is more or less the case. In fact, I just listed the names as they came to my mind. There are also some tertöns who are known by different names. If we briefly look at the three sections of The Rinchen Terdzö, which consists of 30 volumes, making it easy to understand, there is first a discussion of the historical background and of the lineages from which these teachings derive. Second, there is a discussion of the profound teachings that have such a history, of the table of contents, so to speak, and how these teachings are practiced. Third, there is a discussion of the instructions that derive from these lineages. The first section of the instructions is Mahayoga and the stage of development; the second, Anuyoga and explanatory commentaries to the Tantras; and the third, Atiyoga and the pith instructions. Jamgon Kongtrul Rinpoche divided his entire collection of these texts in The Rinchen Terdzö into these three major sections. All of you are already vajra siblings who have entered into the same mandala, especially by receiving the empowerments together. You might wonder how you can uphold the samaya you have as siblings. There is no special samaya with respect to your vajra siblings, such that you can uphold it even if you have undermined your samaya with respect to the Three Roots; at that point, there would no longer be a samaya to uphold. Let me give you an example: Suppose someone has died. If you continue to treat that person as though he or she were still alive, the smell would just get worse from day to day. If this goes on long enough, there could be a risk that the corpse will reanimate as a zombie! Once the person has died, something must be done. Their body must be cremated or buried; it won't do just to leave it lying there. Similarly, once you have undermined your samaya with respect to the Three Roots, you are no longer a vajra sibling. The intelligent thing to do is to practice well and to make sure that it doesn't come to that. If you are someone who is upholding samaya with respect to the Three Roots, it’s extremely important that you uphold your samaya toward your vajra siblings, too. Look at the example of the three masters, Khyentse, Kongtrul, and Chogyur Lingpa; consider what they achieved with their minds in perfect accord, with mutual respect. All of you should try to emulate them and not go against your samaya with respect to the Three Roots. All of you are one another's vajra siblings, so don't be petty by thinking, "She's better than I am. He's less than I am. We're the greatest. I'm the best. We two are the best," and so forth. Since all of you are, in fact, one another's vajra siblings, treat each other as such, but there’s no breaking of samaya if you regard someone who is not your vajra sibling as not being your vajra sibling. That's fine. Do you understand my point? We could pretend to like everybody when facing them, even though we dislike them in our minds. I'm speaking very frankly here. For example, if you spend your whole day smiling at everyone, by bedtime you might actually be scowling. All of us, even Lamas and Tulkus, if we treat the Buddha's teachings as less important than other things and if we treat people who have a favorable opinion of us as more important, or if we treat lineages and our samaya as less important, if we act in such ways, the duration of the teachings in this world will be shortened. Although the Buddha's teachings can last 5000 years, it’s possible that they might not last more that 2500 or 2600 years. Suppose someone has done something for me, has helped me, and I feel obliged to treat him or her more favorably than I would others. It's as though I started with the purest gold, to which I began by adding a single gram of lead. Then I add another gram of lead. At the end of 100 years, 100 grams of pure gold might be mixed with 1000 grams of lead. It’s no longer pure gold, is it? Generally speaking, nowadays there is a real need for cooperation and harmony, but in the depths of our minds we also need to precisely see what is what for what it is and what is not what for what it isn’t. Maybe I have great merit because I grew up surrounded by fine Lamas and fine people who had real altruism. Their nature was one of patience that was as extensive as the current of a mighty river. Their altruism was as pure as the snow of a glacier. Their faith and samaya was as stable as the most majestic mountain. These were the people who helped me grow. It is due to that, perhaps, that people nowadays regard me as being rather set in my ways. But I’d rather be strong-minded and set in my ways than be someone who is easily influenced. Do you see my point? Unless something happens and for some reason I turn into someone who is easily influenced, I will continue being strong-minded. If we consider my Guru - he was the Buddha Karmapa, Rangjung Rigpe Dorje -, I stayed with him for nine years and was influenced by his enlightened form, speech, and mind. There was never any undermining of the samaya between us, and for that reason, out of all the students the Gyalwa Karmapa had, he chose to leave his last will and testament with me, very privately. I think I was very fortunate to be so chosen, but I don't think in the slightest that I am special or that I’m better than anyone else. Rather, I think that he might have entrusted this to me because I’m strong-minded and stubborn. When times are difficult, when the teachings become corrupted, when the five poisonous emotions are on the rise, if something of great importance as The Five Treasures must be accomplished under such circumstances, it won't be an easy thing to do but something very challenging. Suppose a certain family builds a fine house; all their neighbors will become envious. If you really think about it, what's in it for the family that built the house? They can enjoy it. But the envious neighbors, even though they might not have more than a single onyx pendant to wear around their necks, will sell them in order to build an even better house for themselves. Even if those people manage to build such a house, how easy that will have been in comparison to Jamgon Kongtrul Lodrö Thaye’s immense contributions to sentient beings and to the world. In recent times and at present, all the Lamas have been and are working for the teachings. Given that we must work for the teachings in these degenerating times, occasionally one might feel discouraged and think that one’s efforts to help the teachings aren't effective or that one isn't capable of helping. But we shouldn't pay any attention to such feelings. Think of Jetsün Milarepa's complexion, of the color his body turned. When the hunters saw him, they weren't sure if he was a human being or a demon. They thought he must be a demon and began to flee. When they realized he was a human being, they came to have faith in him, given how extraordinary he was compared to other people. And think of what kind of person the first Gyalwa Karmapa, Düsum Khyenpa, was. He had nothing to wear except an old sheepskin. But in the final analysis, he relied on his Guru, undertook the challenges of practice, and achieved a state of spiritual attainment. Nowadays, the seventeenth incarnation of the Gyalwa Karmapa is only twenty-one years of age. But given that he is the latest of the successive incarnations of the First Karmapa, Düsum Khyenpa, in the light of that, just consider what his magnificent presence, personal merit, power and influence, erudition, and motivation are like. You might ask, "How could someone like this come into this world and be present among us?" This came about due to the influence of the enlightened form, speech, and mind of masters of the past. It’s up to their descendants to carry this on. If we think of more recent times, during our own generation, Kyabje Kalu Rinpoche did not have a high position from the outset. But he pursued his practice of the Dharma, had faith in his Root Gurus, had the altruistic motivation toward the teachings and beings, and had great compassion for his students and followers; that is why Kalu Rinpoche became a Lama for the world. If you serve the teachings and if you act with real altruistic intent, then even if you think, "I myself don't need anything," nevertheless, everything will turn out well as a matter of course. Nowadays, in these degenerating times, everyone carries a rope in their left hand and a hammer in their right hand. I don't mean that you see them with these things in their hands, but everyone, in a sense, is carrying them. And what do they use them for? Whenever someone progresses above them, they throw the rope around their legs and pull them down; and whenever someone below them seems to be moving upward, they feel that this makes this person their foe and they beat them down with the hammer. If you wonder what we are to do in times as these, there really isn't much we can do. During the time of the Buddha, his cousin Devadatta felt such jealousy toward the Buddha that he always strove to be just like the Buddha. For example, since the Buddha had naturally occurring designs of a wheel on his palms and soles, Devadatta burned scars of a similar design into his palms and soles with a branding iron. But whatever he did, he couldn't equal the Buddha. One doesn't become a buddha by disrespecting the Buddha but by relying on the Buddha. Finally, the ground under Devadatta opened and he fell into the fire beneath the Earth. At that point he had to cry out, and from his lips came the words, "Gautama, I'm burning! I'm burning!" In the final analysis, this was definitely of some benefit to him. The Blessed One's father, King Shuddhodana, was bitterly disappointed that his son didn’t obey his wishes and didn’t succeed to the throne. In a Sutra entitled Pita-putra-samagama-sutra – ‘The Sutra of the Reunion of Father and Son,’ there is an account of an excellent way in which Lord Buddha’s father came to engender faith in the Buddha. The Arhat Udayin flew through the sky and came to meet with King Shuddhodana. The king asked his minister, "Who is this?" His minister replied, "This is one of Gautama's students." The king thought to himself, "If one of his students is like this, what must Gautama be like?" And the king’s mind began to change a bit. He offered alms to Udayin and requested teachings from him, which caused King Shuddhodana to go to meet with the Buddha. The king made a magnificent spectacle on his journey; he mounted an elephant and had his soldiers, his ministers, and his retinue accompany him. When he reached the place where the Buddha was staying, he saw all the trees and flowers as though they were made of precious jewels. He perceived the tree under which the Buddha was sitting as being far more impressive than his entire kingdom. His pride was broken and he came forward to meet the Buddha. He saw the Buddha as though he were in a palace that was like the vastness of space, in which were contained as many universes as there are grains of sand in the Ganges River. In all directions, he saw Bodhisattvas, who had attained advanced levels of realization, seated on lotuses. Because the king was still an ordinary person, he wasn’t able to see the Bodhisattvas on these advanced levels that had come from other universes; he could only see spheres of light above the lotus seats. In the center of this palace sat the Buddha, and the rulers of the gods, Brahma and Indra, and others were honoring him. The king was dumbfounded when he met the Buddha. He thought, "My son Gautama has become greater than Brahma and Indra, the rulers of the gods!" He forgot all the worries he had gone through by thinking his son would not become heir to his small kingdom and felt extraordinary and decisive joy. According to his own words, the Buddha was first a beggar who owned nothing more than a single bowl of curd. He met Buddha Mahashakyamuni, who was going around collecting alms, and felt faith in him. He offered Mahashakyamuni his food, gave rise to the aspiration to attain sublime enlightenment, and said to the Buddha of a previous age, "May I become just like you!" Then, after three incalculably long eons, he awakened to perfect Buddhahood. So, there’s no way that any of you who are ordained can think, "I'm just an ordinary monk. I couldn't even begin to serve the teachings." Even if you are "just a monk," if you really apply yourself to the practice of the Dharma, you will definitely become just like the incomparable Dakpo Lhaje Gampopa. But it won't be of any use to try hard because of feeling jealous or proud. There's no point in such behavior. Spiritual practice is such that, if you practice purely, you progress as a matter of course. Do you understand what I'm saying? There are many masters, such as Jamgon Kongtrul Lodrö Thaye and Kalu Rinpoche, as well as masters still living, such as Chatral Sanje Dorje. These masters have served and continue serving the teachings of the Buddha. It is my aspiration that you become just like them. So all of you, please take this to heart. Well then, as the saying goes, "If a teaching never comes to a conclusion, it means the teacher is hopelessly lost." And, if a teaching goes on too long, without any end in sight, one just ends up babbling. So we should stop at this point. Thank you very much. And may precious Bodhicitta that has already been never decline but continuously increase! May peace and happiness fully arise for beings as limitless in number as space is vast in its extent. May I and all living beings without exception swiftly establish the levels and grounds of Buddhahood. The original transcript made at Palpung Sherab Ling Monastic Seat in India sent by Zhyisil Chökyi Ghatsal, New Zealand, in 2007, to the editor of this article for editing the books entitled “Nectar of Dharma” by Khenting Tai Situpa. This article, which is excerpted from the introductory teachings, edited and arranged in 2009 by Gaby Hollmann for the Dharma Download Project of Khenpo Karma Namgyal at Karma Lekshey Ling Monastery in Nepal. 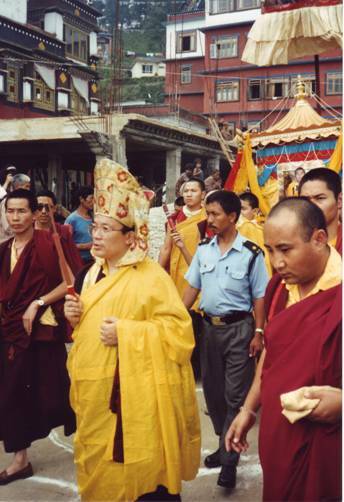 Photo of His Eminence leading the procession of the precious Kudung of our Root Guru, Jamgon Kongtrul Rinpoche the Third at Rumtek Monastery, Sikkim, in 1992 taken by Gaby Hollmann. Photo of beautiful purple lotus taken and - in memory of Jamgon Kongtrul Rinpoche the Third - graciously offered for this article by Lena Fong. All persons and institutes that contributed to this article and that are mentioned here have copyrights. This article is made available for personal use only and may not be reproduced in any form or published. Munich, 2009.